As the airliner swooped down to Milwaukee’s airport last week, the folks in the homes below couldn’t miss the roar of the plane’s engines. I know. I lived one summer across the street from the end of a runway at Green Bay’s airport. At least it is rare for a plane to miss the runway. Imagine living in England’s East Anglia district during World War II. The open terrain of farmland was ideal for airfields, and the Royal Air Force and the US Army Air Forces built dozens, all close together. The Americans occupied 67 airfields. The planes often took off in the wee hours, rousing the entire countryside. Often the weather was foggy. Collisions were too common, with fully fueled and heavily armed airplanes dropping on whatever had the misfortune of being under them. Damaged planes returning from bombing missions didn’t always make it to their airfields. A refurbished American B-24 Liberator bomber on a test flight crashed into an English village of Freckleton and killed 61 people, including 38 school children at Holy Trinity School, on August 23, 1944. 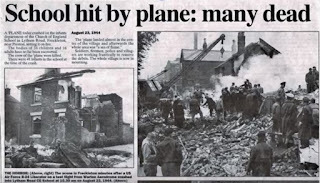 It was likely the worst air disaster in England during WWII. At 10:30, two B-24s took off, but a storm kicked up, and they were instructed to immediately return to the base. By 10:40, conditions had seriously deteriorated, with heavy rain and wind gusts hitting 60 to 70 miles per hour, uprooting trees in the area. At 10:41, the Classy Chassis II began its approach to the airfield. As the planes dropped down to 500 feet and lowered their landing gear, they encountered heavy rain and zero visibility. The second pilot aborted his landing and headed northward out of the storm. The pilot of Classy Chassis II tried to abort his landing as well. It didn’t happen. As the pilot tried to retract the landing gear and pull the aircraft out of its approach to the runway, the violent turbulence and wind gusts threw the 25-ton aircraft with 2,793 gallons of aviation fuel into Freckleton at 10:47 am. The Classy Chassis II first clipped some trees, then cartwheeled. The impact killed the three crewmen. Three homes were partially damaged and the Sad Sack Café was demolished, killing killed 18 of the 20 people inside. The bomber slid across a road and slammed into the infants’ wing of the school. Inside were 41 four- to six-year-old children and two teachers. Seven children and the two teachers were pulled from the burning classroom; only three children survived their injuries. They endured years of surgeries. Wow! I had never heard if this. Thanks for the history lesson. I was not aware of this incident. What a tragedy. Thanks for sharing.